Wow, this is very rock and roll, now users of iShred Live, that killer iPad guitar app can use this StrompBox Pedal controller directly attached to their iPad to help them make some aswesome sounds, without taking their fingers off of their guitar. This is just what rockers have been waiting for, thank you Griffen and Frontier Design group who have developed this in partnership. With assignable foot switches and a 1/4" effects pedal input jack, our StompBox allows musicians to use a compatible iOS device (i.e., iPhone, iPad or iPod touch) as a portable, programmable effects board and practice rig. StompBox effectively recreates the experience of an actual pedalboard. Not yet available but coming soon and retailing for $99.99 this is sure to be a sound hit. Killer effects and tools for your guitar! Just plug in and crank it up: the FREE iShred LIVE app puts you in control of an amp simulator with variable overdrive, and starts you with three FREE awesome built-in effects: the HK-2000 digital delay, the Q-36 Space Modulator/Flanger, and Buzz Kill, a noise gate and filter. 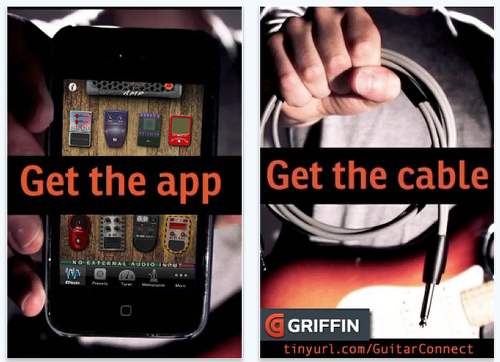 At last, an app for real guitar players to strut their stuff. Hi my nome is Paulo Neiva i’d like too ask if This pedal in the DM1 program for the iPad, is Making the funcion star And stop.